Stored procedure with cursor on a table on a different host might fail. "GenericFailure exception: column store error:  exception in LateMatColumnSource". A memory leak becomes visible when OLAP queries with lot of query entries were executed. As a result the memory consumption of the pool Pool/malloc/libhdbcsapi.so keeps constantly growing. INSERT statements which insert more data than can fit into a single packet into non-LOB-columns will fail with error 1033 ("error while parsing protocol"). Performance was improved for BW queries which have very unrestrictive fems0 filter and restrictive fems-N filters. Decimal places of microseconds are not truncated anymore when transferring values of fields of type "timestamp(longdate)" from database layer to application layer. Significant performance increase in data replication scenarios based on R3Load based on reorganization of database copy processes. M_WORKLOADS is displaying inaccurate EXECUTE_COUNT values under high user load. NEXTVAL is not considered during Upsert/Select join condition evaluation. Fix NullPointerException during Decision Table creation in HANA studio. The stack trace contains: "com.sap.ndb.studio.sdk.resource.repository.core.impl.MDResourceController.initialize"
For more detailed descriptions please see SAP 1877480. "Error saving object: SAP DBTech JDBC: : error while parsing protocol: no such data type"
Wrong code generation of the MDEXISTS function might lead to the situtation that a master data entry is not found, which is actually present in the dictionary and master data table. An indexserver crash might occur when the parallel dispatcher is trying to get job details. An Indexserver crash might occur when the transaction abort method is not called. This occurs when the transaction times out during a table lock. "exception 1: no.2100002 (ptime/storage/cc/lock/WaitGraph.cc:146) invalid trans_id in WaitGraph"
Select on table with varbinary column as part of partitioning key gives wrong results when varbinary value is used in where clause. "Error during plan execution; Failed to find source column row.count in itab." Using analytic privileges on attributes of attribute views - which are itself being used within calculation views - can result in unexpected behaviour in terms of authorization issues. For instance, data access restrictions are not enforced or errors like #column store error: search table error:  user is not authorized" may be shown. 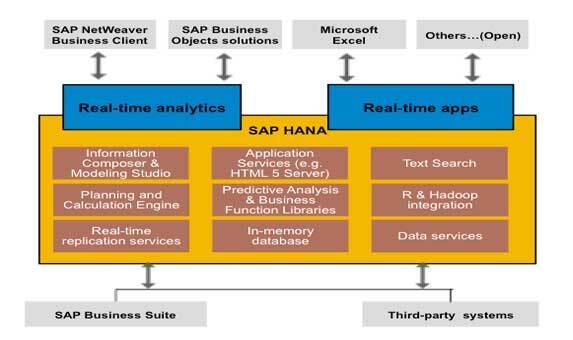 This bug has likely shown up starting with HANA revision 48. Fixed the out of memory situations for very complex script-based calculation views. This issue we improve already with Revision 57. For a more detailed description please see SAP 1852300. Fixed: cannot debug stored procedures that use AFL library. Fixed a stored procedure failure that has sql-filter pushdown with prepared statements. "cePlanExec cePlanExecutor.cpp() : Error during Plan execution of model SYSTEM:AGING_ENTITY_PROCVIEW (-1), reason: SYSTEM.AGING_ENTITY_AMOUNT:... not all variables bound exception: not all variables bound:  not all variables bound: unbound parameter : 0 of 3"
In a scale-out landscape internal tables are allowed to live until the connection is gone unless it is deleted from the point of creation. Dropping transient temporary indices may lead to an error. "EmbeddedAPI Statement.cc(02251) : failed to cleanup temp indexes"
Local temporary tables are created when users issue requests against BIMC tables. Metadata is now used to manage the tables. The Index Server writes incorrect warnning message about NFS 4 file system to the log file. Count on restricted keyfigures in OLAP cubes with n:m joins is not working correctly. A SQL query might fail in scale out system when splitted tables distributed across several nodes are joined together. "partition: search failed in :_SYS_SPLIT_~"
Filter pushdown for guided navigation doesn't work with currency conversion. Query fails with out-of-memory when join_eval trace is set to DEBUG or INFO as >1000Tb get allocated. A specific column view query with a calculation scenario on top fails due to huge results caused by missing filter push-down.
" Error executing physical plan: exception 1999: TRexUtils/IndexHashMap.cpp:689 TRexUtils::IndexHashMapResizeException;in >executor::Executor in cube". Running nested SQL statement to select distinct value from different tables and insert into one table may cause indexserver crash due to compression issue. Fixed failure "Inconsistent calculation model (34011)" in stored procedure functions. CalcEngine ceManager.cpp(01260) : The following errors occured: Inconsistent calculation model (34011)". Filtering a column using the string '' can result in the error message "error parsing lucene constraint: unmatched quotes". A query against a specific column view with attribute mappings in a projection node failed, due to wrong attribute names in the calculation plan. "SAP DBTech JDBC: : column store error: search table error:  Error during plan execution;Failed to find source column in itab." The memory consumption of queries with grouping sets, but without calculated attributes, was too high since aggregations were not pushed down to the OLAPEngine. Queries against calculation views may abort with the error" Failed to find column in input itab"
"SAP DBTech JDBC: : column store error: search table error:  Error during plan execution;Failed to find column in input itab"
When a batch insert with statement routing is executed via python then the slave nodes can not be determined if the table is hash(string)-partitioned. The corresponding hash function is not found and the calling statement returns false. Fixed wrong environment for Storage Connector during add host operation in a distributed landscape. Fixed potential Fiber Channel Storage Connector issue on persistent reservation acquisition (HANA was not able to start if this occurs). Fixed: Statistics server is continuously throwing alerts "Join graph not connected; join not connected (HY000))" after the index server restarted from a crash. Upgrade fails for a few Custom Storage Connectors. Output line 1: Program terminated with exit code 0"